To view the Cherokee size chart, click here. To view the WonderWink size chart, click here. To view the Fashion Seal Labcoat size chart, click here. To view the Meta Labcoat size chart, click here. 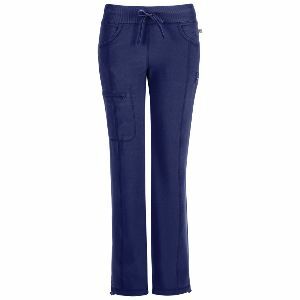 A Contemporary fit, low rise, straight leg pant features an elastic knit waistband and adjustable drawstring. Also featured is a rib front and back yokes, slash pockets, front leg seams with a zip closure cargo pocket, one back patch pocket, a bungee instrument loop below left pocket, a bungee cord with a toggle at the leg hems for adjustability and cover-stitch detail throughout. Inseam: 34"
Please be sure to select items from the same brand/collection to ensure color match. Returns will not be accepted for mismatched brands. Please contact Ted Fitzgerald tfitzgerald@allcustomwear.net. You may need to cut and paste Ted's email address into your composed email. To request additional product selections or program support, please contact Dave Spinks dspinks@allcustomwear.com. Exchanges are allowed for incorrect sizes and must be done within 30 days of receipt. Returns are not accepted unless the product you receive is damaged or the product you receive is not the product that you ordered. To request a return, please email Ted Fitzgerald tfitzgerald@allcustomwear.net. Please include your order number, as well as the garment styles and sizes you want to return. Returns are at purchaser's expense. Please allow 10-15 business days for delivery of your order.